En la celebración de su décimo aniversario, el Festival Día de Lummis del Noreste de Los Ángeles por primera vez incluyó a Boyle Heights en su lista de eventos de tres días. El viernes por la tarde el escenario de la Plaza del Mariachi deleitó a la audiencia con presentaciones de poesía, música internacional, actuaciones de Casa 0101, el instituto Diavolo de Boyle Heights y cerrando con broche de oro con la música del Mariachi Tierra Mexicana de Óscar Chávez. In celebration of its 10th anniversary, the Lummis Day Festival of Northeast Los Angeles expanded its programs for the first time to the city’s eastside. The three-day rainbow of multicultural expression, which took place last weekend, for the first time included musical performances and other activities at Mariachi Plaza in Boyle Heights. 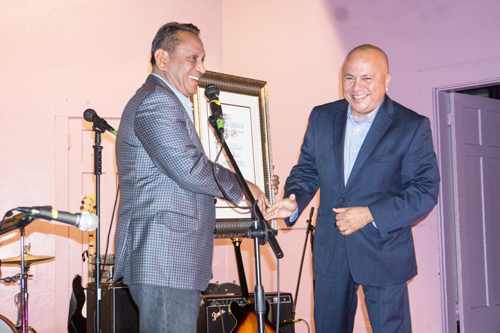 Boyle Heights residents Manuel Lima and Fernando Castañeda were among the hundreds of people at the event last Friday. They said they were impressed with how different it was from other events held at the plaza, perhaps best known for the Mariachi groups that gather and play there in hopes of being hired. Speaking in Spanish, Castañeda told EGP he’d never hear d of Lummis or the festival before last week, and he thought the event was very well done. 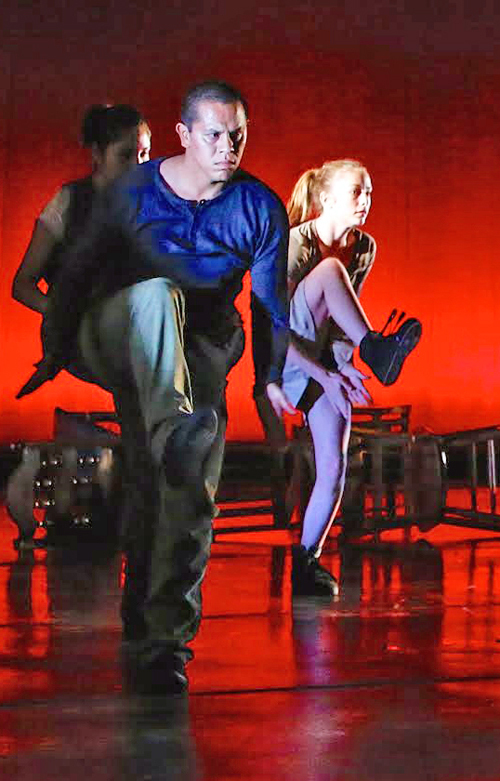 He said the students in the Lincoln Heights-based Diavolo Institute reminded him of professional performers. Eliot Sekuler, one of the founders and organizers of the event, told EGP that none of the Northeast L.A. Neighborhood Council Members who a decade ago started the festival dreamed it would be still going strong today. “We can’t stand still and do a one day event anymore,” Sekukar said. “We wanted to expand,” to grow, he said. “This is also known as the festival of the eastside, so let’s really be on the eastside,” he said. Atwater-based songwriter and accordionist Jessica Fichot entertained the hundreds of people gathered at the Plaza with her unique fusion of styles and languages. Singing in French and English, she transported the audience to imaginary streets of France. Performances by the rock band Suspect, Los Angeles Poet Laureate Luis J. Rodriguez and CASA 0101 actors were crowd favorites. Julio Walter traveled from Temple City to hear Mariachi Tierra Mexicana de Oscar Chavez, getting there early enough to get a prime front row seat. Practicing with his guiro (scrapper), he told EGP he took Metro to the festival. “I enjoy mariachi music and I like to play along with their rhythm,” he said. 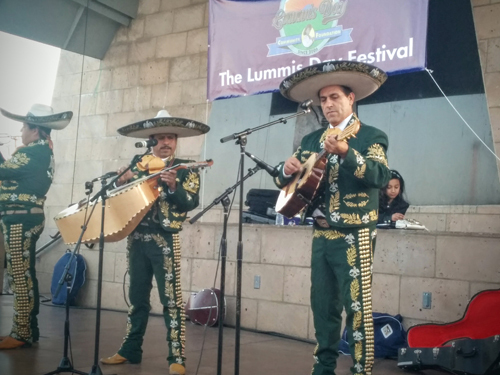 Perhaps as a nod to the area’s strong Mariachi history, the first Lummis Day event on the eastside closed with the sounds of Mariachi music. Unable to stop himself, Walter played along with Mariachi Tierra Mexicana, whiles others got to their feet to dance to the energetic Mexican music. 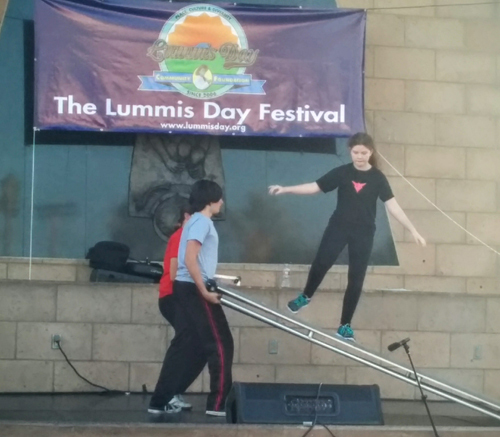 The multicultural Lummis Day festival drew thousands of guests during the three-day event. The festival is named after Charles F. Lummis who was a writer, photographer, poet and founder of the Southwest Museum, the first museum in L.A.
Lummis helped introduce the concept of multiculturalism to Southern California and was a champion of the Native American and early California culture. His home, El Alisal—Lummis Home—was one of five sites in Northeast L.A. where festivities took place on Saturday and Sunday. Crafts exhibits, music by Dave Porter and Hector Sanchez and the sound of Native American poets filled the home with entertainment. At the Southwest Museum, the exhibit “Back to the Roots, A Tribute to Richard Duardo,” recognized the legacy of Artist Richard Duardo. On Saturday, Mariachi music, opera and the works of chalk artists and a performance by Celtic Ceili Dancers were the highlight at York Park on Avenue 50 and York. The biggest festival venue was at Sycamore Grove Park where four stages were setup to accommodate performances by Buyepongo, Stand Easy, Trio Ellas, Ballet Coco, Sirenesque, Flamenco and Hip Hop performers. Activities also included food vendors, puppet shows, balloons, mini field soccer matches and other family- and kid-friendly activities. “We felt we definitely had to be part of this event to honor the legacy of Charles F. Lummis,” Chris Morris, a spokesperson for the National Trust for Historic Preservation told EGP. “That was originally his vision, celebrating the native history and culture of the Arroyo,” she said. Un sospechoso de violencia doméstica que lastimó a su novia el sábado y después sufrió una fractura mientras huía de la policía en Montebello fue detenido el domingo después de entregarse. Conrado Ferrer, de 23 años, se peleó con su novia alrededor de la 1:10am del sábado, dijo el detective de la policía de Montebello, Paul Antista. “Durante el altercado, Ferrer mordió a su novia en su dedo, la empujó al suelo lo que la hizo golpear su cabeza en una pared de bloques y luego comenzó a estrangularla”, dijo el detective. Mientras trataba de escapar, Ferrer saltó del techo de un edificio de apartamentos y se rompió el brazo, según Antista. Una vez en custodia, él dijo que quería suicidarse. Ferrer fue llevado a Beverly hospital para el tratamiento de la lesión en el brazo y una evaluación psiquiátrica, pero a las 5:19am del sábado se escapó del hospital, vestido sólo con una bata, dijo Antista. Ferrer finalmente se entregó a la policía a las 2:30am del domingo en la Estación de Montebello, dijo el teniente Rick Rojas. Un hombre que murió cuando su vehículo perdió el control y acabó metido debajo de una rampa de autopista el domingo por la mañana fue identificado como Antonio Rafael Pérez, 22, según la Oficina del Forense del condado Ángeles. El accidente ocurrió a las 3:05am en la carretera de transición de la autopista Golden State (5) hacia el norte a la autopista en dirección este de San Bernardino (10), de acuerdo con el registro de incidentes en línea de la Patrulla de Caminos. Las imágenes de vídeo de la escena mostraron que el vehículo de Pérez, una SUV, fue aplastada hasta el nivel de la manija de la puerta por el impacto del golpe. Él fue declarado muerto en la escena. El festival anual Lummis en su décima edición se llevará a cabo este viernes, sábado y domingo en diferentes áreas del noreste de Los Ángeles y Boyle Heights. Una mezcla de la mejor música, baile, comida y celebración de la historia y tradiciones artísticas se presentarán en nombre de Charles F. Lummis, quien fuera escritor, fotógrafo y fundador del primer museo en Los Ángeles, el Southwest Museum. Su casa El Alisal, conocida como la Casa Lummis continúa en pie, cerca del museo. Para más información visite www.lummisday.org. Three Days in 5 Different Locations. Enjoy poetry, crafts & music at Lummis House, 200 E. Ave 43, Highland Park; Music, dance, & puppets at Sycamore Grove Park, 4700 N. Figueroa St. Highland Park; Mariachi music, dance, poetry & theater at Mariachi Plaza-Boyle Heights Farmers Market, 1831 E. 1st St., Boyle Heights; Art, Music & “A Tribute To Richard Duardo” at the Southwest Museum, 234 Museum Dr., Mt. Washington; and music, opera, art at York Boulevard Park, Ave 50 & York Blvd in Highland Park Activities are free & open to the public. For more details, visit www.lummisday.org. Two very different films depicting young people coming of age and using music and art to overcome adversity will be screened Saturday at the annual Lummis Day Movie Night at the Wellness Center, the newly opened office and community space located in Los Angeles’ historic General Hospital complex in Boyle Heights. Film Night opens with the 46-minute documentary “From Invisible to Invincible,” the story of six homeless youths in Los Angeles who struggle to end their personal cycle of chronic homelessness. Using art created by each of the six young men, the film chronicles their life on the streets and their successful struggles to transform their lives. All six of the subjects are clients of Jovenes Inc., an organization that provides housing and other essential services to homeless and at-risk Los Angeles youth. 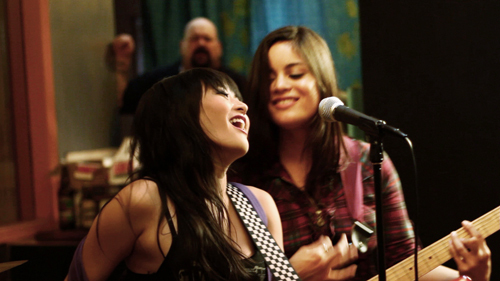 Next up is the award-winning indie-rock tragicomedy “The Crumbles,” written and directed by Akira Boch. In “The Crumbles,” Darla’s overly serious, stagnant musician’s life is shaken up when her free-spirited, musically gifted long-lost best friend Elisa crashes on her couch… indefinitely. Elisa seems the perfect partner for the band that Darla has long wanted to form, but insecurity, heartache, and oversized egos all work against them. 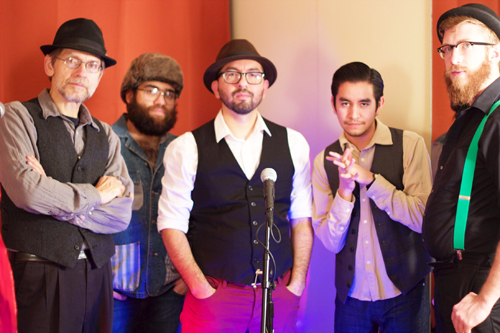 Filmed in and around Northeast Los Angeles, the movie features a soundtrack by Lummis Day veteran musician Quetzal Flores. The Crumbles won the Audience Award at the San Francisco International Asian American Film Festival and earned a “Best Supporting Actress” nomination for Teresa Michelle Lee from the National Film Society Awards. Running time for “The Crumbles is 75 minutes. Tickets for the event are $15. All proceeds support this year’s Lummis Day Festival. Order tickets online at www.lummisday.org or, for more information, call Bob Kieft (323) 259-2504. Watch the website for updated information about the screening. The Wellness Center is located at 1200 North State Street. A free shuttle bus will be provided between the Highland Park Senior Center and the Wellness Center, courtesy of Los Angeles City Councilmember Jose Huizar.